Gessi Bolognesi: Notable Chalk Hills and Karstic Plateaus on the Doorsteps of Bologna. Situated on the first hills just at the outskirts of the city of Bologna – Emilia-Romagna's regional capital – the Gessi Bolognesi protected area is crossed by four small rivers or streams: Savena, Zena, Idice and Quaderna. 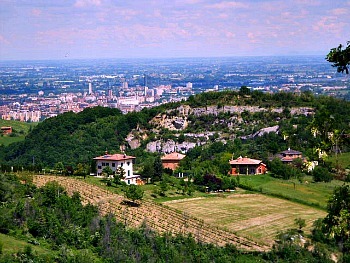 In its interior are to be found areas of naturalistic and historical value, as well as noteworthy landscapes (above, see a picture of the chalk outcrops, with Bologna in the background and the plains that stretch beyond the city to the north). The Gessi Bolognesi are famous for their caves (numbering nearly 200), the most evident result of karstic activity in the area. There are guided visits to the longest of these caves (the Grotta della Spipola; read below), while fascinating excursions are possible also in the spectacular scenery of the Calanchi dell’Abbadessa – extraordinary gullies resulting from the erosion of permeable clay – or on the sunny chalk outcrops of the Miserazzano plateau: a particular moon-like landscape with splendid views over the city. Also worth visiting is the small WWF reserve of the Molino Grande (all this information is explained in greater detail below). The area is protected by a Regional Park ('Parco Regionale dei Gessi Bolognesi and Calanchi dell’Abbadessa') that was instituted in 1988; its surface is of 4,844 hectares (3,117 ha of park and 1,727 of pre-park), the majority of which befall within the municipalities of San Lazzaro di Savena and Ozzano nell’Emilia, with smaller sections in Bologna and Pianoro. The altitude ranges from 64 metres in the valley bottoms to about 375 m on the Settefonti hill and at Monte Calvo – this latter location touching nearly 400 m.
The park headquarters are at Casa Fantini in San Lazzaro, where information material can be collected prior to an excursion; during weekends the visitor centre “Villa Torre” in Ozzano is open too. In San Lazzaro one can also visit a small archaeological museum ('Museo Archeologico L. Donini') that displays the most important finds in the area. 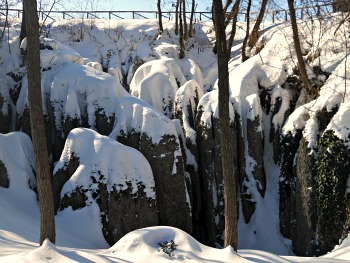 The Gessi Bolognesi Regional park had as a main reason for its institution the protection of the extended chalk formations that have given life to a karstic complex which figures among the foremost in Europe. The action of water on the chalk outcrops has modeled the landscape in unusual and characteristic ways, unique in the surrounding hills: big depressions in the shape of funnels; smaller karstic holes known as ‘dolines’ (amongst which is the biggest and best known, the so-called 'Grotta della Spipola'); plateaus where the crystalline, chalky rock glows to the point of owing it the name of ‘selenite’ (literally “moon rock”) for its pale, lunar reflections; sink holes that capture and redirect the surface water in the depths, generating more than 150 caves populated by bats and other creatures accustomed to a subterranean environment (in the picture above, the great sink hole – or doline – of the Spipola, as seen from the small plateau of Miserazzano). Amongst these, as already mentioned, particularly interesting is the Grotta della Spipola, where the park organizes a dense program of guided visits in order to admire the elements which are typical of karstic habitats. 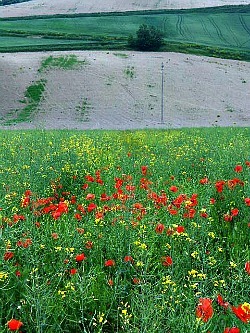 In the Zena valley one can also find the Grotta del Farneto, which cannot be visited but it is nonetheless an archaeological site of particular relevance, where finds dating to the Bronze age were discovered; these are now shown in the Archaeological Museum in San Lazzaro (below, a typical springtime landscape of the Gessi Bolognesi, with the poppy fields that enliven the soft clayey hills of the lower Zena and Idice valleys). In the eastern section of the protected area, by contrast, on the soft rolling hills of Ozzano the scenery is dominated by the wilder Calanchi dell’Abbadessa – an arid ridge drawn above a tormented sequence of thin crests and small valleys, modeled in the so-called ‘Argille Scagliose’ (a type of clay), which are also the oldest rock formations in this section of the Apennines. The area of the ‘calanchi’ offers the visitor unusual and very atmospheric natural landscapes, populated by birds of prey and other wild presences, and enlivened by the colourful blossoming of broom and trefoil – especially spectacular at the beginning of summer. In this sector of the park one can also admire many historical traces, mainly linked to the medieval and Renaissance periods. In this area the agricultural activities are particularly developed, with farmsteads devoted to organic techniques as well as the presence of educational farms such as the 'Dulcamara'. The park administration has devised specific projects with some of these farms, dedicated to the purpose of helping the spread of organic farming techniques and the development, promotion and sale of quality local products (below, see a picture of the Calanchi dell’Abbadessa). To stimulate and expand the knowledge of the territory covered by the Gessi Bolognesi protected area, guided visits are also being offered on a regular basis – especially in the caves, but also on more general themes connected with nature. Organized in different seasons of the year, these naturalistic visits give the visitor a chance to observe close-by – and with the aid of an expert – the peculiar vegetation and wildlife of the karstic habitats: mainly flora, fauna and the geologic characteristics of the territory. The most atmospheric visit is certainly that of a natural cavity – the Grotta della Spipola: here, after descending a 700-metres long trail without particular difficulties, one can encounter all the main phenomena typical of chalk and karstic landscapes: vaulted channels, the so-called 'mammelloni' (big stalagmites) and alabaster-like debris-flows. 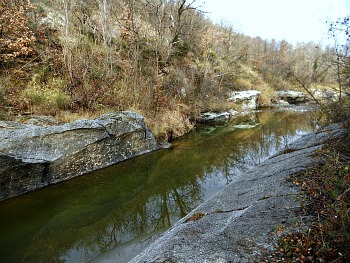 To get a glimpse of the innumerable motives of interest present within the Gessi Bolognesi Regional Park, one can visit the protected area either on foot, ride it, or cycle; one can follow the equipped Nature trails, minor roads and the network of marked paths, all reported in the maps and on other material published by the park. 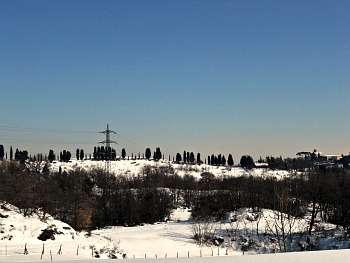 The Gessi Bolognesi are of course connected to the surrounding areas – especially the middle sections of the Idice, Zena and Savena valleys, and thus linked with wider walking itineraries that cross the park and connect it with other focal points situated outside it, such as the Passo della Raticosa (Raticosa pass) and the ‘via Flaminia Minor’ – an historic route to Tuscany – or other valleys of the region touched by medium- or long-distance trails, such as the ‘Traversata delle Cinque Valli’, which, as the name suggests, connects Ozzano to Zola Predosa across the section of five valleys (for more information on this, see Bologna Appenines). 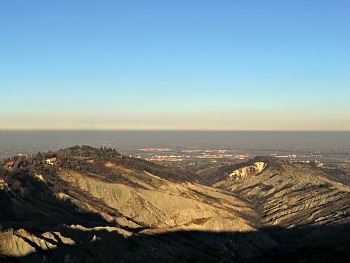 The ‘Traversata del Parco’ ('Park's Crossing'; read below) is instead a long-distance trail with a west-east orientation that allows the visitor to experience the great diversity of environments found within the park, and the different habitats encountered – from the sunny chalk plateau of Miserazzano (another image of it – looking across the ‘Dolina della Spipola’, visible to the right– is displayed below) to the humid and shady depths of the 'doline', to finish with the wilder and desert-like Calanchi dell’Abbadessa. Nature Trails have been devised and are properly signposted and marked in several areas of the Gessi Bolognesi Regional Park. They will take the visitor to discover different environments, from the chalk outcrops of the Dolina della Spipola and Miserazzano in the west (see picture above) to the eastern section of the park, where wild patches of landscape still survive very close to the busy thoroughfare of the via Emilia, dominated by the presence of the spectacular formations of the Calanchi dell’Abbadessa. This trail accompanies the visitor to the discovery of the ‘Dolina della Spipola’ – one of the most extensive karstic systems in Europe – and touches all its most significant locations, such as the entry to the cave itself (at the bottom of the doline bearing the same name). The excursion to the area can ideally be started at the parking of Madonna dei Boschi, in an area characterized by the presence of extensive chalky outcrops in an obvious karstic setting. The itinerary starts by the chalk wall known as the ‘Palestrina’, traditionally used for rock climbing by local groups, and which probably also represents one of the oldest quarry fronts in the hills around Bologna – most likely used since Roman times (see a picture of it below). 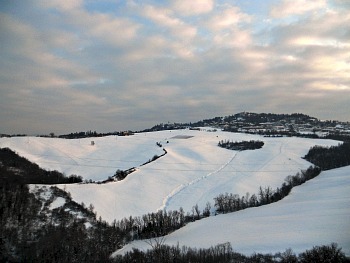 From there, one can further descend to the atmospheric ‘Buco delle Candele’, characterized – as the name suggests – by formations that mimic the shape of candles. After a brief digression to the panoramic plateau of Miserazzano, the Nature Trail reaches the bottom of the doline by the entrance of the Grotta della Spipola. 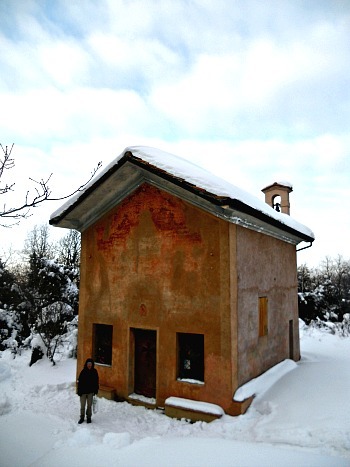 Climbing up from the bottom through steep stairs cut into the doline slope, one finally reaches via Madonna dei Boschi, in the vicinity of which is a small oratory with the same name ('Oratorio della Madonna dei Boschi'; see image below). On the other side of the road is the area known as ‘Cava a Filo’, where chalk used to be extracted using helicoidal wires. This is also the site of important archaeological digs, with finds dating to the Paleozoic era and relevant paleonthological discoveries. The trail then goes around the summit of Monte Castello (272 m), which offers good views over the ‘blind valley’ of the Acquafredda stream and on nearby Monte Croara (283 m), then enters into the woodland, where it goes past the above mentioned chapel of Madonna dei Boschi, dating to the 16th century – after which one rejoins the beginning of the trail (below, a winter view of a small olive plantation near the area of Madonna dei Boschi is a testimony to the Mediterannean influences in the climate). 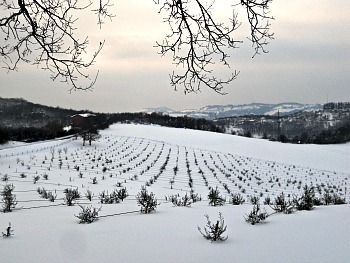 This trail is developed inside the Podere Foiano, near the ancient settlement of Settefonti (literally, ‘Seven Springs’). This farm – also known as 'Dulcamara' – has been dedicated in the last few years to organic farming methods that actively help safeguarding biodiversity, and there is a joint project with the park, which sponsors numerous initiatives throughout the year, geared at environmental education. As well as giving an insight into the different activities run within the farm, this trail also commands open views over the surrounding hills, and especially on the wildest section of the Calanchi dell’Abbadessa – a narrow ridge that connects the farm and the area known as ‘Passo della Badessa’ (literally, the "Abbess’ Pass") to the village of Sant’Andrea below: a tormented patch of relative wilderness where it is not rare to spot Foxes, Roe Deer and Wild Boar roaming. It is also possible to start the walk from the town of Ozzano nell’Emilia, using a path that follows the course of the small Marzano stream, then gains a crossroads by an ancient holy cross; from there, by taking the tarred road, one can reach the church of Sant’Andrea at the lower end of the trail, which starts there and then leads upstream to the Foiano farm. This itinerary starts by the hamlet of Sant’Andrea – an ancient settlement of medieval origin that can be reached also on foot from Ozzano nell’Emilia by taking the path that begins at the end of via Don Minzoni and follows the course of the Marzano stream (see above). The ancient Church of Sant’Andrea dates back to the 11th century but it was rebuilt at the end of the 18th century, and still guards some relics of the Beata Lucia of Settefonti; in it, are also kept the stumps that, according to a romantic legend, were used to imprison in the Holy Land a local rider known as Rolando, who was allegedly freed thanks to Lucia’s intervention, abbess at the Monastery of Settefonti (a building which has now long disappeared – but memory of it still survives in the name of ‘Passo della Badessa’, which bears witness to the most notable legend of this area). After this visit (but the church is normally closed), the path makes a sharp bend to the left, along a country road that goes along the extensive historical park of Villa Corte-Massei, rebuilt in the Neo-gothic style on more ancient sediments of religious origin. At the end of the road, beyond a private home, one can also admire a monumental specimen of Holm oak – a solitary witness of the propagation towards the north of a much more Mediterranean vegetation. The trail then enters a section that was cultivated land until a few years ago, and which – after agriculture was abandoned – nature has reclaimed for itself, with the spread of an intricate thicket of shrubs, wild flowers and berries: a first indication of the future return of woodland, if the area is left unmanaged. Once reached the bottom of the Rio Centonara (another small stream), the spectacular formation of the Calanchi dell’Abbadessa shows itself in all of its imposing outlook: several small valleys converge downstream from the main ridge – a sign that the steep clayey slopes are in constant movement, with the naked rocks that display their ancient and chaotic geological past. Visible here are also the landslides and the deep marks left by erosion: it is fascinating, in this eerie landscape, to observe the materials which were cast into clay, where – during the wet seasons – the signs of passage of wild animals such as roe deer and wild boar are left imprinted in the soil. One should also notice the harshness of the vegetation, which shows signs of adaptation to a poor, hard and salty subsoil. Once past the Centonara stream – thanks to a small ford – the trail keeps at the base of the formation of the Calanchi dell’Abbadessa, which from here looks like an amphitheatre, until a crossroads where, keeping right, starts the ascent along a steep clayey slope, covered by the typical vegetation of the ‘calanchi’: juniper, several types of broom and a profusion of herbs – some strongly aromatic, some others more noticeable for the vividness of their colors (such as the spectacularly crimson coloured blossoms of a plant locally known as ‘sulla’ – Hedysarum coronarium, a type of trefoil). Rising more in altitude, one can then admire in all of its lenght the tiny, narrow ridge that connects Monte Arligo (230 m) to via del Pilastrino, known as ‘Passo della Badessa’ (already mentioned above). The trail becomes very panoramic at this point, as it allows to acknowledge oneself with different aspects and tiny variations in the landscape – current as well as historical. Even in the dry – and apparently lifeless – domain of the clays, one can spot tiny areas of wetland, often at the base of the ‘calanchi’ or close to small depressions in the ground. The importance of such environments cannot be underestimated: little mammals, birds, amphibians and insects all survive thanks to the presence of these micro-ecosystems rich in life. Also, from a viewing platform to the right of the trail, it is not uncommon to spot Roe Deer, Fox, Wild Boar and other animals. Crossing then a pleasant ‘warm’ woodland formation of Pubescent oak (Quercus pubescens) mixed with Manna ash (Fraxinus ornus) and Field maple (Acer campestre), one eventually reaches Podere Foiano (mentioned also in the previous trail) – a model farm applying organic techniques within the area of the Gessi Bolognesi Regional Park. In the farm, it is also possible to walk the Trail of Sustainable Agriculture (see above), which allows to acknowledge oneself with many farming techniques that are respectful of natural resources and of the environment, as well as acknowledging oneself with 'forgotten' fruit varieties. This itinerary can be followed all the way along the road that descends to Ozzano, where one soon encounters the dilapidated building of the ancient Pieve di Pastino (11th century), after which the trail makes a sharp left into a country lane that first crosses old cultivated fields then becomes a path entering the woodland, and eventually leading back to the valley bottom of the small Centonara stream, where one can rejoin the path used for the ascent. Given the importance of this area for geology, within the territory of the Gessi Bolognesi Regional Park four thematic trails have been devised, centered around geological and paleonthological themes. These were developed thanks to a collaboration between the Park authority and the respectworthy Museo Capellini of the University of Bologna. 4) “via del Pilastrino – Castel de’ Britti”: this trail is almost entirely dedicated to clays, and it also offers a magnificent view over the Calanchi dell’Abbadessa, touching the houses of Ciagnano and then descending on the Idice valley floor by the historical settlement of Castel de’ Britti, while skirting the spectacularly impressive morphologies of the Calanchi of Rio Calvane along the way. Each of these itineraries requires approximately three to four hours to complete; bear in mind that many are not easily practicable after heavy rainfall, precisely because of the clayey nature of the soil, which makes it extremely muddy. It is not particularly dangerous to walk along the trails anyway, but in that case, be prepared to get extremely messy! You can find additional information on these trails at the park's visitor centres mentioned above (be reminded, however, that most of the documentation is only in Italian). This itinerary is developed as a crossing (‘traversata’) on the chalk ridge between the valleys of the Idice and Zena streams. In the territory of the Gessi Bolognesi the gypsum (or chalk) outcrops are better preserved and more beautiful than anywhere else, also from an aesthetic point of view, and there is in them a notable variety of natural situations and environments to be admired – especially linked to karstic phenomena, both at surface level and in the depths (subterranean karstic activity). This trail starts by the park’s headquarters at Casa Fantini (just 95 metres above sea level), and quickly rises along the slopes of the chalky hills above it, towards Monte Calvo (at about 380 metres, this is one of the highest elevations within the park; see above an image of the verdant views that open up from its summit, looking towards the highest part of the Northern Apennines). This section of the walk alternates stretches of thick, shady woodland mainly composed of Pubescent oak (Quercus pubescens) along impressive chalk banks, and other more open stretches, with views over the Zena valley. The woodland is, as said, dominated by Pubescent oak together with Manna ash (Fraxinus ornus); several other species typical of arid habitats also appear – such as common Privet, Spanish Broom and Scorpion Senna (Coronilla emerus), plus some Mediterranean plants like Wild Asparagus, Broom (Cytisus scoparius), Dyer's Greenweed and Dog Rose. Following the red-and-white striped CAI markings, the path then descends, reaching an altitude of about 260 metres and a clearing dominated by an old specimen of Olive tree, after which it enters again into a woodland dotted with sinkholes (‘doline’). Following now the country lane named via di Gaibola, one soon gains the northern edge of the Dolina dell’Inferno (the ‘Hell's doline’), covered by thickets of vegetation characteristic of fresher and more humid environments. Looking closely, one cannot fail but noticing some large specimens of Hop Hornbeam (Ostrya carpinifolia) close to some impressive Pubescent oaks, and other shrubs such as Hazelnut (Corylus avellana), Fly Honeysuckle (Lonicera xylosteum), Elder, Spindle and Cornelian Cherry (Cornus mas). There are also, in this area, interesting and beautiful spring blossoms to be admired, such as Primroses, Violets, Lungwort, Hellebores and Comfrey; ferns are also present in a certain quantity, especially Maidenhair Fern and Polypody (Polypodium vulgare), which stand out with their characteristic leaves among the stumps and the chalky outcrops – the latter often covered with carpets of mosses and lichens. In the karstic depressions – whose morphologies are more or less evident beside the trail – it is also not uncommon to spot rarer plants that come to blossom in early spring, usually just after snowmelt, such as Alpine Squill (Scilla bifolia), Snowdrop (Galanthus nivalis), Winter Crocus (Crocus biflorus) and Dog’s-tooth Violet (Erythronium dens-canis), while in the summer there is here a rare, isolated station of Martagon Lily (Lilium martagon) – quite an unusual sight at such low altitudes. As one proceeds along the way, the woodland becomes sparser, and it visibly alternates with chalk outcrops, where – in the right season – it is quite easy to spot Common- and Green Lizards sunbathing; then, one reaches the little ridge that separates the Dolina dell’Inferno from nearby Dolina di Gaibola. Here the environment is drier and sunnier, therefore the Pubescent oak thickets have a richer understory, with mainly yellow flowers in spring (Cytisus and Coronilla species; several types of Broom) – while in the summer pink and mauve colours dominate, as in Pinks (Dianthus species), Dog Rose and Mallow (Malva species). Leaving a sloping field to the right (‘cavedagna’ in the local dialect), one then goes past an open space that was once the platform used when chalk was being extracted from the surrounding hills (now this activity is over, as it was extremely damaging for the environment – but the scars are still visible everywhere, and they are now important traces in order to ‘read’ the landscape and its history). The walls of this ex-quarry are now being re-colonized by shrubs, amongst which one can notice Wild Pear (Pyrus pyraster), Pubescent oak and Manna Ash – as well as several types of rock plants such as Helichrysum species, Wormwood (Artemisia absinthium) and Viper’s Bugloss (Echium species). Further down, one can also notice the presence of Karrenfelds – 'ridged fields': a typical phenomenon of karstic areas, created by water running over the rocks (chalk, in this case). 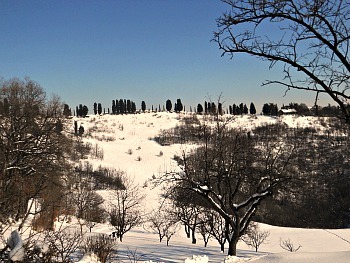 As one proceeds, on the right opens up the sight of the Dolina della Gaibola, which appears covered up by patches of woodland alternated with thickets of spiny shrubs that have adapted to life in this harsh environment (the chalk surfaces get extremely hot in summer, while during the winter the bottom of a doline is, conversely, very icy – as cold air tends to stagnate). The path now heads towards a dilapidated rural building that is a reminder of this area having suffered massively from the abandonment of traditional agricultural practices, which are now making a timid comeback – in certain places, at least – thanks to the presence of the park (this is more so in the eastern section of the Gessi Bolognesi Regional Park, but here – because of the harshness of the chalky soils, combined with the vicinity to the city of Bologna – agriculture is much less likely to return; in its own way, however, this arrangement is also useful, as it allows to ‘read’ directly on the landscape what happens when human intervention is discontinued, and Nature reclaims its rhythms). From here, one can descend towards the Idice valley floor, and thus complete the trail; another way of closing the circuit (a longer – but circular – option) would be to keep on the marked CAI path that skirts the eastern flank of the Dolina di Gaibola and, after crossing an arid chalky outcrop that offers an open view on the Idice valley, eventually reach via dell’Eremo, which allows a direct descent into the Zena valley in the vicinity of the park’s headquarters, where the trail had started. This is the most demanding itinerary within the Gessi Bolognesi, as it takes 7 to 9 hours to complete and is about 12 km long; the gradient in altitude is of approximately 700 metres, up and down. This walk must be undertaken with care, and it is advised to experienced walkers only, but from west to east, this is also the crossing that best allows the visitor to get to know all the most notable habitats and landscapes within the Gessi Bolognesi protected area. The trail starts in San Lazzaro di Savena and finishes in Ozzano nell’Emilia, the two main municipalities within the Gessi Bolognesi Regional Park; near the former is the area of the Gessi Bolognesi, while in the territory of the latter fall the Calanchi dell’Abbadessa. Both centres are very easy to reach from Bologna – Emilia-Romagna's regional capital – and even though the trail can be embarked either way, for the sake of clarity here I will describe it assuming a west to east direction. Thanks to its proximity to the so-called Pianura Padana (the vast plains of the ‘Po valley’), this itinerary commands constant views in that direction, on the nearby city of Bologna and – on clear winter days – on the faraway, glimmering sight of the summits of the Venetian Alps. On the other side, with clear weather, there are also rewarding views towards the highest mountains of the Northern Appenines (Corno alle Scale, Cimone, Cusna). Let’s get going with the walk, then! First, from the suburb of Ponticella (in the municipality of San Lazzaro di Savena) we walk uphill on via Benassi, reaching the area known as ‘La Palazza’, on the margins of the Dolina della Spipola (the most notable karstic hole within the Gessi Bolognesi). This plateau – collectively known as Miserazzano – hosts a wealth of karstic phenomena on the chalky rocks. Among its most representative features are certainly the above mentioned Dolina della Spipola, the largest doline of its kind on chalk in Europe; the atmospheric ‘Buco delle Candele’ (characterized, as the name suggests, by vertical erosion formations that mimic the shape of candles; see image above), the steep chalky banks of the ‘Palestrina’ and the area known as ‘Cava a Filo’, where in the 1960s important paleonthological discoveries were made, with the bone remains of a bison that came to light, now kept at the local museum ‘Luigi Donini’ in San Lazzaro. This first stretch is completed with the crossing of the ‘blind valley’ of the Acquafredda (pictured below) – and one can notice here the spot where the stream suddenly disappears under the chalk bank to form a subterranean system connected also to the Grotta della Spipola, at a depth of 115 metres. The water will then resurface again, after an underground course of about 10 km, further north by the Savena stream. Rising from the bottom of the Acquafredda ‘blind valley’ we then gain the hilltop where the ancient Church of Monte Calvo still stands (at 367 metres above sea level; see image below); after that begins the descent towards the Zena valley floor, across a small area of ‘calanchi’ – peculiar shapes connected with water erosion on clayey soils. Beside the building of the park’s headquarters, Casa Fantini, starts the second section of the crossing. 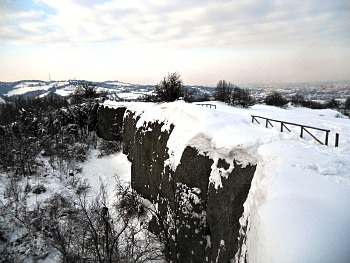 On an unstable slope (which for this reason it is unsafe to approach) is found the opening to the Grotta del Farneto – the other notable cavity within the territory of the Gessi Bolognesi Regional Park. A landslide now blocks the entrance, but a project in order to allow access again to this important site is currently under way; in this location, from 1860 onwards, various researchers operated (amongst them were Giovanni Capellini – founder of the Paleonthological Museum in Bologna, Francesco Orsoni and Luigi Donini – a local researcher to whom the museum in San Lazzaro is dedicated). The finds excavated here witness a continuity of human presence since the Bronze age, and are now mostly kept at the Capellini Paleonthological Museum, owned by the University of Bologna. From the Zena valley bottom we now head towards the Idice valley; in order to do so, we will cross another notable chalk environment. In fact, we will first skirt along the perimeter of the Dolina della Gaibola and Dolina dell’Inferno (the ‘Hell's doline’), mentioned above, then descend again – eventually reaching a ford on the Idice stream. The trail then crosses the main road and ascends on the opposite side of the valley; this slope is particularly sunny, and so it is one of the few locations within the park to be dedicated to a small, high-quality vineyard plantation (there is another one on the highest, south-facing slopes of Monte Calvo). 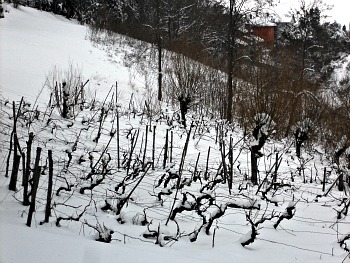 After a couple of km, we reach the houses of Ciagnano and the notable viewpoint of via del Pilastrino, in the territory of Ozzano nell’Emilia (see below a winter picture of low vines growing in the park). This very open spot dominates the wild expanse of the Calanchi dell’Abbadessa – the other naturalistic highlight of the Gessi Bolognesi Regional Park: an articulated system of small valleys that water erosion has drawn on soft clayey soils; on the top, a tiny ridge is occupied by a very narrow and unstable passage known as Passo della Badessa – the ‘Abbess’ Pass’, as it were, which takes its name from an old legend (see above). 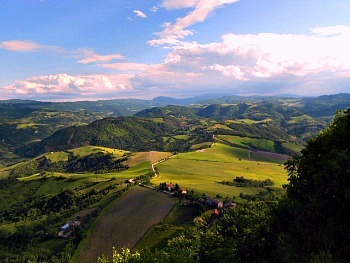 From there, the highest summits of the Northern Apennines are visible in clear weather; rewarding views also open up towards the immense plains to the north; on clear days the distant Alps are in sight too, and exceptionally – with the help of a good pair of binoculars – one can even spot on the horizon the azure line of the Adriatic sea and the Valli di Comacchio. At the end of via del Pilastrino, in the vicinity of Agriturismo Dulcamara and the Podere Foiano (see above), another section of the path will take us down to the town of Ozzano nell’Emilia, skirting this time the eastern flank of the Calanchi dell’Abbadessa, with interesting views and also more occasions for animal sightings. Within the territory of the Gessi Bolognesi Regional Park there are several possible itineraries to be accomplished with a Mountain Bike, presenting different degrees of difficulty. It is recommended to stick to marked paths and not to stray off-route, especially during the rainy spells, as the clayey nature of the soil makes it particularly unstable and hence unsafe (small landslides can also be provoked by movements). Just to give an example, an itinerary is suggested here, which is of medium difficulty and is therefore – on the whole – suitable to all abilities. The itinerary starts by the park’s headquarters at Casa Fantini, in the Zena valley. Beside the stream, we can observe a riverside environment which is very rich in vegetal species typical of wet habitats; a majestic specimen of Quercus pedunculata is to be noticed – an oak that can be typically found growing near wetlands – together with several species of willows and poplars. Here there are also a few small "bat houses", which hang from the trees in order to study the local populations – these are all bat species that are particularly affected by the interventions of deforestation, and suffer in areas which are traditionally poor in trees (as is tends to be within the Gessi Bolognesi). We leave the area by taking the wide via Jussi, heading north towards Farneto, but only for a small stretch. After this locality, past the ancient church of San Lorenzo – already existing in the 14th century – by a sharp bend we turn left, then immediately right along a country lane that crosses an old river shelf, now cultivated. This stretch takes us to via Seminario, which further leads to another historical location, Pizzocalvo – an ancient site above which now stands the church of Santa Maria Assunta. By a crossroads we head down to the small reserve of the Molino Grande, where it is possible to admire interesting riverside habitats; by the entrance, there are the remains of an old lock, and there is also a monumental specimen of Quercus pubescens – a type of oak particularly well-adapted to dry conditions. After this digression, we retrace our steps until the crossroads, and now take the right into via Montebello; after about 1 km we turn right again and head uphill into via Gaibola. At the head of a steep rise we reach the so-called ‘Casone di Gaibola', where a statuary cypress marks the highest point of the itinerary. From there, we can look into the Dolina di Gaibola – one of the widest within the park. The trail skirts its length for a good while, along the ridge that separates it from another doline, the Dolina dell’Inferno (‘Hell's doline’) – an extensive karstic depression already mentioned above (it is to the west of the path). One can easily notice how, inside the dolines, there are patches of woodland typical of warmer habitats along the edges and on the slopes facing south, with a contingent of Mediterranean species too; on the contrary, at the bottom of the doline, there are often formations more adapted to colder and damper locations, with species more typically associated to beech woodlands (usually found above 800 metres). This phenomenon is due to the so-called thermal inversion – a consequence of the particular conformation of the dolines: as they are funnel shaped, this causes the cold air to stagnate at the bottom for a more prolonged time, thus lowering the temperatures. Keeping on along this way, which meanders in a fascinating environment with a predominantly flat and chalky bottom, we eventually reach via dell’Eremo: a road that – with a sharp descent (check the brakes!) – takes us back near the starting point, by the park’s headquarters. All in all, one could say that a visit to the Gessi Bolognesi Regional Park is a rewarding way to spend a day (or more) exploring the nature around Bologna. 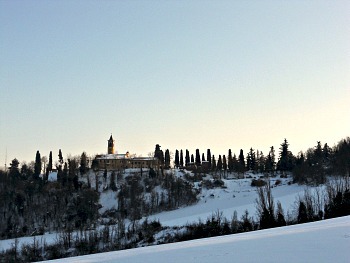 Besides the undisputed geologic value, its most characteristic aspect is best summed up by the view of the majestic lines of cypresses that crown the summit of the hills near Miserazzano. 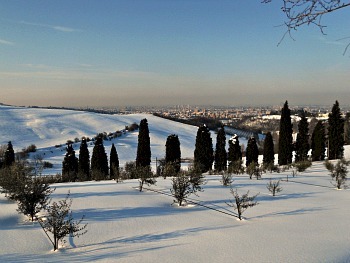 These trees (together with the occasional olive plantation) are perhaps the most direct reminder of the fact that we are located on a threshold between the 'iconic' Mediterranean landscape of peninsular Italy and a more continental climate to the north (in the picture below, olive trees and cypresses appear together by the hill of the Croara; the regional capital of Bologna is visible in the background). Why a Chalk (‘moonstone') Dry-stone Wall by the Park at Belpoggio? The area of Belpoggio is sited inside the Parco Regionale Gessi Bolognesi-Calanchi dell’Abbadessa, precisely in an area where chalk cropping up is the main feature, and the characterizing feature both at landscape and ecological level. Chalk is a sedimentary rock of chemical origin which formed roughly 4 million years ago, when the Mediterranean basin was partly desiccated, and calcium sulphate (a salt naturally present in seawater) precipitated on the sea bottom, and subsequently rose. In order to build the dry-stone wall, blocks recovered from an ex-quarry in the Val di Zena have been used, and, as binder, a certified bio-lime has been applied, so to guarantee a very low emission of CO2 in the production phase, without pollution also in the application phase, neither for the soil nor for the atmosphere; additionally, bio-lime constitutes a perfect cement for the irregular blocks of chalk, which it is not so easy to assemble. A wall only partially cemented like this one allows to obtain in a little space a great variety of environmental conditions, depending on the aspect and exposure to the sun (north or south), as well as the position (top, central and lower part of the dry-stone wall); very diverse are also the micro-environmental conditions in the holes or cracks, depending on their dimension, depth, and the possibility that the water may reach and wet the cracks, and keep them damp for a long time, or not. This great variety of environmental conditions in such a short amount of space has then be exploited in order to put the plants that typically grow on the chalky rocks of this area, as well as recreate the dry habitats associated with them. Quite naturally, this new habitat, although created artificially, will be colonised and appreciated also by many small animals, such as lizards, and — last but not least — some particular pollinating insects too.